Listen to archives of the Generation Web® radio show. 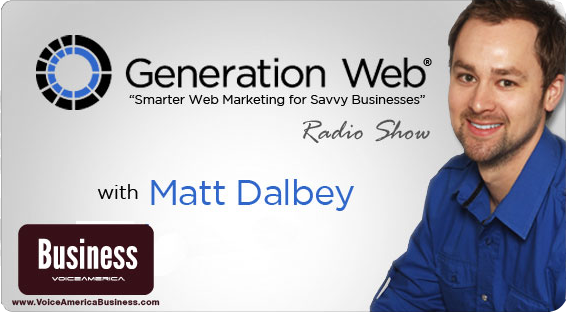 Generation Web equips savvy businesses for smarter Web Marketing. The generation of the Web is now. The Web is the “first and last” place prospects go when they are ready to buy. Covering a range of topics including Search Engine Optimization/SEO, Pay Per Click Marketing, Online Lead Generation and Social Media Marketing, Web marketer and speaker Matt Dalbey, shares practical Web wisdom while bringing together top experts to discuss relevant, cutting edge topics that your business simply can’t live without. Shaped by Google®, Facebook® and other “Web forces”, the Internet is changing daily. In the generation of the Web, prospects must be wooed before they can be won. Today, consumers and B2B buyers are empowered to find and be“friend” you before they will buy from you. Opportunities are endless to reach buyers Online, but only the smart, savvy Web Marketer will win.